Oh . my . God! Wasn't it Tuesday just yesterday? Time once again to visit on the farmhouse porch - the porch of Everyday Ruralty. Ha!! We have no lawn. Problem fixed. When we moved here we decided to cover the front yard with landscaping and mulch. The back yard is a brick patio and mulch. No pesky grass. I should note, however, that we have a stamp size front and back yard since we live in a townhouse community. :-) Our "fix" wouldn't work for most people. We are very happy NOT being large land owners. If someone gave you $500 dollars, and you could not spend it on yourself, who would you spend it on? I would spend it on my mom who currently lives in Assisted Living. It would pay for only 2 days of care but I can't think of another person who deserves (and needs) my help more in that regard. Her life was never flush with assets. She saved and led a frugal life, and now we are blowing through that savings with breath taking speed for her Assisted Living. It makes me sad. She lived with me for 5 years prior to being admitted to Assisted Living. 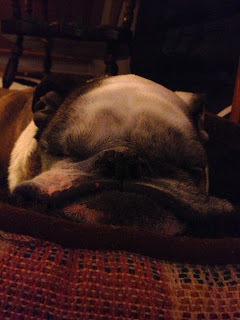 You can find our story together on my blog at Through My Caregiver Eyes label. My experience was not a traditional "sandwich generation" story ... my kids were grown and on their own, but my life with mom mirrors many of the struggles that others have faced. Funny you should ask. I just came off a considerable blogging break (about 2 months). Blogging breaks sort of catch me by surprise. I don't know they are coming. All of a sudden I notice that it has been a week, then two, and before I know it an official break from blogging has occurred. This last break was the longest. I couldn't get in gear to write even one word, although ideas would pop up in my head, and I would say to myself ... yes, I should blog about that ... and then I wouldn't. I am back now but never say never with regards to blogging breaks. Yes, year round, in door and out door! And if I could be more compliant in taking my allergy meds, my life would be more peaceful. Nothing. I lead a very busy but boring life. All I can say at this point is ... tomorrow better not be TUESDAY!!! My nightstand is was filled with books I wasn't reading (blogging was not the only thing I wasn't doing.) If I wasn't blogging or reading blogs, maybe I should be reading some of my many books! that can capture my attention. I pitched a bunch of them ... titles that were worthy of buying many moons ago seemed boring and irrelevant now. 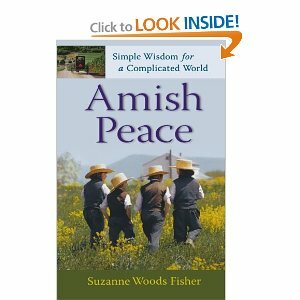 And then I picked out Amish Peace: Simple Wisdom for a Complicated World, by Suzanne Woods Fisher. I can't remember when I got this book ... but it was a theme that caught my attention sometime in the past, and I wanted to sit down and read it right now ... so I did. Amish Peace is filled with short chapters about the central themes of Amish life. Each chapter includes Amish proverbs and facts about the Amish community told through the words of real Plain People. Each theme shows how less can result in more ... more peace! Simplicity of life style, respect for time, focus on family and community ... are a few of the themes concisely covered in this small book. Although "going Amish" is outside the realm of reality (in fact it is nearly impossible), their wisdom is definite something to be emulated. In my own life, I have used a few tried and true methods to simplify and add more peace to my own life. Back down external commitments to create more down time. De-clutter my environment to make my world seem less "busy" and stressful. But that is just the tip of the iceberg for the Amish culture. There is so much more to learn from these people who have managed to successfully live in a way that is simply contrary to "the American way of thinking." "If you admire our faith, strengthen yours. If you admire our sense of commitment, deepen yours. If you admire our community spirit, build your own. If you admire the simple life, cut back. If you admire deep character and enduring values, live them yourself." Blessed are they who have nothing to say, and can't be persuaded to say it. He who has no money is poor; he who has nothing but money is poorer. Enjoy today. It won't come back. I used to prefer to drive, but now my husband's eyes are so poor that he has given up driving. I am the only driver in the family. I love being driven now - it seldom happens, but when it does it is pure joy for me. I love blueberry preserves. They aren't very common - easier to find strawberry! I will be attending Maryland Sheep and Wool Festival in May. This is a major event for me - sort of like High Holy Days for knitters, weavers, and spinners. In June I will visit The Mannings in PA for their annual Spin In (a day long event devoted to spinning wool). In August, I plan to attend the annual Knit In at The Mannings (a day long event devoted to knitting). See a theme here? Lots of folks are becoming aware of issues with food. There are many articles, books, and movies on topics like allergies, GMO, pesticide use, bad or no labeling, over processed foods, foods from other countries that may not have high standards, and many more topics. What concerns you the most? If nothing concerns you, have a cookie and skip to the next question. Guess I am pretty trusting about my food and the suppliers. I am sure there are issues, but I am 66 and have eaten pretty freely without regard to food safety (other than making sure to avoid spoilage or undercooking), and I haven't had any problems. I am trying to eat less processed foods and more fruits and veggies, but that is it. Do you use nail polish often? Finger nails, piggies, or both? Never. All my nails are a mess. I am not fussy in that regard. what God was thinking when he made lips like these? and we thought he might not make it. And here we are today, with the the best picture ever of any lips on the planet! Wow, that was a long blog break! And I had no idea that a break was coming. And if you "blink" ... things change. I missed blogging! (I guess that shouldn't be a shocker, but it was.) I missed writing. I missed visiting blogs. I missed being visited. A good blogger friend was hospitalized! Double yikes!! So sorry, HappyOne. Diane, when you make a change you don't mess around. My cousin who knits, spins, and weaves ... knits, spins and weaves rings around me! Talk about productive, Linda. (So I clarify a bit. This isn't new behavior for her. exacerbates the impact of her creative output. ) Hangs head in shame. I panicked a bit when Google Reader announced their departure. They were my blog post capture tool. Oh my God!! How will I keep up with everyone? (... that is after I stop blinking) But now I subscribe to blogs by email - a much more civilized method of keeping up with blog posts. So "good riddens" Google Reader - I blinked, you bowed out, and my blog life improved! So there, Goggle Reader! Going forward I need to be more reasonable about blogging - so I can avoid the "blink" effects. Blog on a semi- regular schedule. At least once a week sounds good - thanks for the idea, Noofy. Limit blog subscriptions. It is totally unrealistic to have over 500 outstanding blog posts to read. And, seriously, that was the number when I was brave enough to peak at Google Reader during the blink. Subscribe to blogs by email - I get new posts each day a little at a time. Really, folks, that has been refreshing! who don't have blink issues. I have a tale of woe. I must share because you guys are the only ones who will understand. Normal response for a logical, intelligent, enthusiastic person in this situation ... ? OK, not normal or intelligent, but it is what happened. Now, today I took my first walk in 5 months. Here is the blow-by-blow of how it went. Stepped out the door in my new expensive walk/run shoes. Plugged in my new audio book to keep me company. Weather ideal. Cool, clear, perfect. 100 steps out, my left big toe joint began to hurt. 10 minutes later the toe pain stopped. and my $400 prescription orthotics?? Pain resolves in about 5 minutes. Nose starts to run. Allergies. But I am prepared. I have tissues. Tissues have blood in them. I have a nose bleed. Headed back home. Walking in the front door, the toe is fine, the heel is fine and my nose bleed dries up. I can hardly wait for tomorrow! I have lots more body parts that don't want to cooperate. PS - Not blogging. Just sharing. Hard to know where to start. Hard to know what to say. I wouldn't call it a "blog fade," but it might be a "blog cliff." I sort of feel like I fell off of a cliff back in February when I suddenly stopped blogging. I have spent some time trying to sort out in my mind why I am not blogging. I asked myself a bunch of questions. Are you giving up your blog? No, I don't think so. That doesn't feel right. Are you going to blog in the near future? No, I don't think so. I am not really inspired to do so. Do you know why you are not blogging? Not completely. I get ideas for posts, I take pictures ... but it stops there. So here I sit trying to figure out why I am not doing more of this thing ... this thing that I am doing right now. What I do know is that over my life time I have a habit of over committing ... and then dropping out ... and then creeping back into stuff again ... until I over commit again ... then drop out ... and ... and ... and ... It is a lot like going in circles. Been there. Done that. Seem to be doing it again! Anyway, I thought I would drop in just to say hi! Everything is alright here. Life is full and busy. I miss being here, I really do, but I can't seem to get my act in gear just yet to write. So ... I am off again. Not blogging yet! Take care all. I'll check in again when my head is more connected to my neck! !